Renaissance Mass Murder Bowd Stephen D.
Auteur : Bowd Stephen D.
Renaissance Mass Murder explores the devastating impact of war on the men and women of the Renaissance. In contrast to the picture of balance and harmony usually associated with the Renaissance, it uncovers in forensic detail a world in which sacks of Italian cities and massacres of civilians at the hands of French, German, Spanish, Swiss, and Italian troops were regular occurrences. The arguments presented are based on a wealth of evidence - histories and chronicles, poetry and paintings, sculpture and other objects - which together provide a new and startling history of sixteenth-century Italy and a social history of the Italian Wars. It outlines how massacres happened, how princes, soldiers, lawyers, and writers justified and explained such events, and how they were represented in contemporary culture. 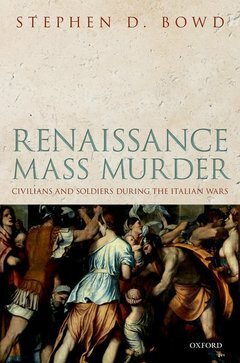 On this basis, Renaissance Mass Murder reconstructs the terrifying individual experiences of civilians in the face of war and in doing so offers a story of human tragedy which redresses the balance of the history of the Italian Wars, and of Renaissance warfare, in favour of the civilian and away from the din of battle. This volume also places mass murder in a broader historical context and challenges claims that such violence was unusual or in decline in early modern Europe. Finally, it shows that women often suffered disproportionately from this violence and that immunity for them, as for their children, was often partially developed or poorly respected. Stephen D. Bowd works at the University of Edinburgh and has published widely on the history of the Italian Renaissance and on culture, religion, and belief in Venice and its empire between 1400 and 1550.